ILSR’s report, Yes! 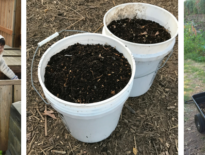 In My Backyard: A Home Composting Guide for Local Government, profiles 11 home composting programs (10 in the United States, 1 in Canada) and is a guide for local governments starting their own programs. The report has an extensive chapter discussing the pros and cons of ordinances on home composting. Appendix D features ordinances from four communities discussed in the report.